MANILA, Philippines—Cigarette in one hand, Joseph “Erap” Estrada grinned when the TV screen the size of a billiards table broke the news on Monday night that Benigno “Noynoy” Aquino III was leading the presidential race. Supporters around him in his Polk Street home in San Juan City, including his daughter Jerika Larize, looked uneasy but to the 73-year-old man gazing at the huge screen in front of him, the race was far from over. Groans rose from those around him in the expansive living room each time numbers were announced that showed Aquino had increased his lead. MANILA, Philippines—Look who’s laughing now. After being hounded by suspicions and accusations that he was part of a plot to bring about a failure of elections, Gen. Delfin Bangit, the chief of staff of the Armed Forces of the Philippines, Tuesday triumphantly saluted his troops for the successful conduct of the country’s first automated balloting on May 10. Even Bangit’s rumored bitter rival, Philippine National Police Director General Jesus Verzosa, said the success of the elections was a vindication of sorts for Bangit, who is known to be a favorite of President Gloria Macapagal-Arroyo. On the other hand, Ms Arroyo had reportedly tried to replace Verzosa who had been vocally against supporting any military exercise to back alleged moves to extend the President’s term. (Updated 4:11 PM) Voting hours will no longer be extended, the Commission on Elections (Comelec) said on Monday afternoon after various groups sought another extension. MANILA, Philippines – Overwhelmed by the number of complaints from irate voters on Monday, some precincts have opted to adopt a number system to manage the swelling crowd. Voters who endured long lines to cast their vote reported on social networking sites that they were given ‘stubs’ with priority numbers. The stubs correspond to a specific batch or time the voters will be allowed to do the actual voting. Failure of elections has been recommended to 11 municipalities in the Visayas and Mindanao due to various reasons, among them the non-appearance of election inspectors, the Commission on Elections (Comelec) said on Monday. Included in these towns are Masiu, Lumba-Bayabao, Lumba-Unayan and Tubaran in Lanao del Sur where members of the board of election inspectors (BEI) failed to show up, said Comelec spokesperson James Jimenez at a press briefing. MANILA, Philippines — Commission on Elections Chairman Jose Melo has declared that Comelec is 98 percent ready to hold the national automated elections on Monday and urged voters to resist the lure of guns, goons and gold on the historic day. Melo assured Filipino voters that the elections, which hurdled time constraints and technical and legal obstacles, would proceed as planned. “We have a reason to smile. Our big problem, which caused this big worry are the CF (compact flash) cards. Now, all the voting machines, all the ballots, all the ballot boxes are in place. They are in the voting places,” Melo said in a press briefing at the Comelec command center at the Philippine International Convention Center. “Go to the precincts early. Go to the polling precincts prepared. Don’t be intimidated, don’t sell your votes. We should keep this election as clean as possible,” he reminded voters. PNP chief Director General Jesus Verzosa has alerted the 130,000-strong police force to be on the lookout for possible election vote buying at the precinct level. Verzosa ordered PNP unit commanders to field intelligence operatives to monitor the activities of persons engaged in vote-buying and vote-selling activities. “This is currently the most common form of vote buying in our election history. Before, candidates would pay voters to vote for them, this time, voters are paid not to vote. In effect, these voters are paid to waive their right to vote,” Verzosa said. MANILA, Philippines — Despite assurances from the Commission on Elections, election automation worrywarts are bracing themselves for the worst. The Halalang Marangal (Honorable Elections), through its secretary-general, information technology expert Roberto Verzola, urged the public to carefully watch the final testing and sealing of the PCOS machines, after the storing of the reconfigured compact flash memory cards, and report to media and election monitors any discrepancy between the machine and the manual counts. Halalang Marangal includes among its convenors former Sen. Wigberto Tañada, former Comelec commissioner Mehol Sadain, and retired General Francisco Gudani. The Commission on Elections Comelec revealed on Monday that they have been receiving “credible” information that there are plans to delay or prevent some voters from voting on election day. “Whats happening is that some individuals will purposely delay the voting in some areas to prevent voters from voting,” Comelec Commissioner Gregorio Larrazabal said at a press briefing. Larrazabal explained that the plans would entail disrupting the voting process to delay, prevent, or discourage voters from taking part in the elections on May 10. OZAMIZ CITY, Philippines—With less than a week before the balloting day on May 10, the Nacionalista Party mayoral candidate in hinterland Concepcion, Misamis Occidental has asked the Commission on Elections to place the town under its direct control. In a phone interview, reelectionist mayor Benjamin Pilota, a retired Army colonel, said his camp has been worried over persistent reports from their community leaders about the activities of a group of armed men roaming from village to village intimidating people. Pilota claimed that the villages usually visited by these armed men are his known bailiwicks, and their activities have become more frequent as the political campaign is now in the homestretch. MANILA, Philippines (1st UPDATE) – With exactly a week to go before the elections, Armed Forces of the Philippines (AFP) chief of staff Delfin Bangit and Philippine National Police chief Jesus Verzosa led government troops in an interfaith rally on Monday morning at Camp Aguinaldo. Priests, pastors and imams prayed over military troops who will soon be deployed to help secure the first ever nationwide automated elections. “I’ve seen how the Philippine National Police worked 24 hours a day, and also, the components of the armed forces, just to be able to deliver a very good and a very credible election for our nation,” Bangit told the soldiers. MANILA, Philippines – Retired generals who joined the 1986 People Power revolution and served the administration of the late President Corazon Aquino have re-grouped to protect the votes of her son, Liberal Party (LP) presidential candidate Senator Benigno “Noynoy” Aquino III. “We are prepared. Our group has prepared to protect and ensure that each of the Filipino voter’s vote shall be counted,” said retired Major General Ramon Montaño in a press conference on Wednesday. The former chief of the now defunct Philippine Constabulary, which was later absorbed into the integrated Philippine National Police (PNP), said Aquino is the clear choice of the Filipino people. MANILA, Philippines—The men who worked closely with disgraced former election commissioner Virgilio Garcillano as he rigged the 2004 presidential elections are still well entrenched for the May 10 polls this year. Together, the so-called “Hello, Garci” Boys control Mindanao, which is home to more than 10 million registered voters. “Hello, Garci” became a popular phrase to refer to how President Arroyo addressed the commissioner when she was caught on tape asking Garcillano to ensure her a lead of at least 1 million votes over her rival, Fernando Poe Jr.
MANILA, Philippines – A total of 27 people, including a mayoralty bet and five running for councilor, were killed in 75 election-related violent incidents during the first 105 days of the campaign period for the May 10 general elections. Philippine National Police (PNP) spokesman Chief Superintendent Leonardo Espina said yesterday the figure is lower compared to the 2004 and 2007 elections. Espina said investigators were validating 61 more incidents, initially reported to be election-related, although there were indications that the motives were personal, business, and work related. (Updated 8:03 p.m) An improvised explosive device went off on Monday in the southern Philippine province of Sarangani as Governor Miguel “Migz” Dominguez’s convoy was passing by, local police said. No one was reported hurt or killed. Superintendent Felicisimo Khu, acting regional director of Central Mindanao, said they would determine whether the blast targeted Dominguez, who was on his way to meet Lakas-Kampi-CMD standard bearer Gilberto “Gibo” Teodoro Jr. in General Santos City. Khu said the incident occurred about 11:45 a.m. along the National Highway in Malapatan town. He said the explosive was planted on an abandoned red motorcycle. MANILA, Philippines – The Commission on Elections (Comelec) is preparing for a random manual auditing of elections results, according to Henrietta de Villa, head of the poll body’s committee on random manual audit. She said part of the plan is the deployment of an additional 3,500 public school teachers to ensure the accuracy of random manual auditing. De Villa said the committee has recommended the creation of a special board of election inspectors to undertake the manual audit. DAVAO CITY, Philippines — The Nacionalista Party team of presidential candidate and Senator Manuel Villar and his running mate, Senator Loren Legarda, supported, on Sunday, the Commission on Elections’ decision to disallow a parallel manual count pushed by certain sectors, including a senator running under the Liberal Party. Villar said preparing for a parallel manual count was already next to “impossible” because of time constraints. MANILA, Philippines – The Commission on Elections (Comelec) is postponing Thursday’s mock polls in Metro Manila to Monday next week. This was revealed by National Citizens’ Movement for Free Elections (Namfrel) chairman Jose Cuisia, who said delays in the delivery of ballots and other poll paraphernalia prompted the rescheduling of the mock elections. “There are also problems in the delivery of the Precinct Count Optical Scan machines,” Cuisia added. MANILA, Philippines—The security of the first nationwide automated elections in May is in the hands of Philippine Military Academy (PMA) “Makatarungan” Class of 1978, the batch that adopted President Arroyo as honorary member. At the Philippine National Police (PNP), Class ’78 has yet to clinch the topmost positions, but abs-cbnNews.com/Newsbreak shows they are well-placed on the ground, especially in vote-rich regional commands. Class ’78 has total or partial control of the 17 Joint Security Control Centers (JSCCs)—1 per region—organized by Task Force Hope, which is composed of officers from the AFP and the PNP tasked to secure candidates and polling centers in May. MANILA, Philippines – The Armed Forces of the Philippines (AFP) and the Philippine National Police (PNP) have begun implementing security plans for the May 10 elections even as the number of private armed groups has reportedly increased during the campaign period. Army Col. Ricardo Nepomuceno, action officer of the Task Force HOPE (Honest, Peaceful and Orderly Elections), and Lt. Col. Edgard Arevalo told a news briefing at the Palace that troops have been deployed in voting areas ahead of the polls. Nepomuceno said special attention would be given to areas identified by security agencies as election hotspots. MANILA, Philippines—Journalists covering the defense beat on Monday added their voice assailing the decision of the Department of Justice (DoJ) to absolve two Ampatuan clan members from the murder charges in connection with the Maguindanao massacre. “We, the members of the PNP (Philippine National Police) Press Corps, denounce the recent DoJ ruling dismissing the murder charges against Zaldy and Akmad Ampatuan,” journalists assigned in Camp Crame said in a statement. The group directly linked Malacañang to the controversial decision of acting Justice Secretary Alberto Agra to exonerate the two clan members. A panel of government prosecutors on Monday claimed to have been bypassed by Justice Secretary Alberto Agra in his decision to clear two members of the Ampatuan clan in the massacre of 57 people in Maginadanao last year. A GMA Flash Report quoted the prosecutors as saying that Agra had not consulted them, as a matter of courtesy, before he ordered the dropping of multiple murder charges against detained Autonomous Region in Muslim Mindanao Gov. Zaldy Ampatuan and cousin Akmad Ampatuan, mayor of Mamasapano town in Maguindanao. MANILA, Philippines—The military and police may need additional help in securing the counting machines that will be used in the May elections because they do not have enough manpower for the job, a Palace official said Friday. Executive Secretary Leandro Mendoza said this matter was raised by the Armed Forces of the Philippines and Philippine National Police in a command conference on Thursday that included officials of the Commission on Elections. The meeting was held to review preparations being done for the May 10 general elections. The counting and canvassing of votes in the May 10 polls will be done electronically for the first time in the country’s history. An organization of persons with disabilities (PWD) on Friday stormed the Commission on Elections (Comelec) to protest why it had not been approved as an accredited party-list group in the May polls. In an interview with reporters, Gigi Ruiz of the Disabled Pinoy Party-list (DPP) scored the poll body for denying the organization’s motion for reconsideration (MR) to be accredited as a party-list group in the May polls. “This is just to express our indignation over the violation of our rights to political participation,” she said. An official of the Commission on Elections (Comelec) on Friday said that poll machine supplier Smartmatic-Total Information Management (TIM), not the poll body, should pay for the ultraviolet (UV) lamps that will be used to verify ballots on election day. MANILA, Philippines—Despite the Supreme Court’s affirmation of Ang Ladlad’s right to run in the May elections, an official of the Catholic Church believes the party-list group for gays, lesbians, bisexuals and transgenders should not be allowed to enter Congress, and said he would discourage people from voting for it. “Pag nanalo si Villar, sigurado ako, i-bu-bully siya ng lahat sapagkat siya ay tatanungin, ‘Ano ang ginawa mo sa C-5?’” (If Villar wins, I’m sure, everyone will bully him because he’ll be asked, ‘What did you with the C-5?’) He will be hounded by all kinds of investigations [about] his past,” said [Sen. Richard] Gordon. “In the same way, Noynoy Aquino will be hounded on why [his family] cannot declare land reform in their [lands] in Tarlac. He will be hounded why he cannot give justice to the farmers in that massacre in Tarlac,” he added. MANILA, Philippines– United Opposition (UNO) vice presidential bet Jejomar C. Binay said Friday that Filipinos should analyze the real reason behind the government’s insistence to collect 12 percent EVAT on tolls paid by private motorists on April 30, as well as the fire sale of government properties, as it may be a ploy to fund pabaon schemes for outgoing officials. “Why, all of a sudden do they want to push this issue? Is the government as bankrupt as it appears or is this merely an attempt to give outgoing officials a chance to line their pockets with taxpayers’ money before they come down from their posts?” Binay asked in a statement emailed to media organizations. CEBU CITY, Philippines—Cebu Archbishop Ricardo Cardinal Vidal and top police officials led Friday’s signing of a covenant for peaceful and honest elections witnessed by hundreds of government employees and individuals from various parts of the Visayas. Before the signing of the covenant, Philippine National Police Director General Jesus Verzosa led hundreds of policemen from various parts of the Visayas in a three-kilometer march from the Fuente Osmeña rotunda to the Archbishop’s Residence, where the signing ceremony was held. 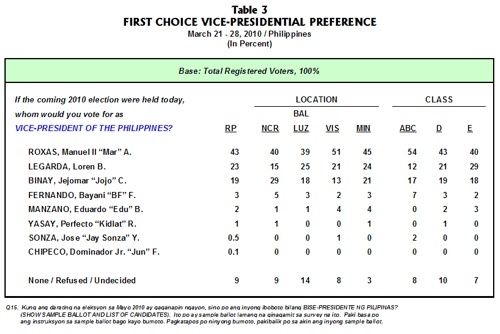 MANILA, Philippines 1st UPDATE – Sen. Benigno “Noynoy” Aquino III leads in the latest Pulse Asia survey with a 12 percentage-point advantage over closest rival, Sen. Manuel “Manny” Villar, Jr.In the Pulse Asia survey conducted from March 21 to 28, Aquino got 37% support followed by Villar with 25%, former President Joseph Estrada with 18%, administration bet Gilbert Teodoro with 7%, Sen. Richard Gordon with 2%, Bro. 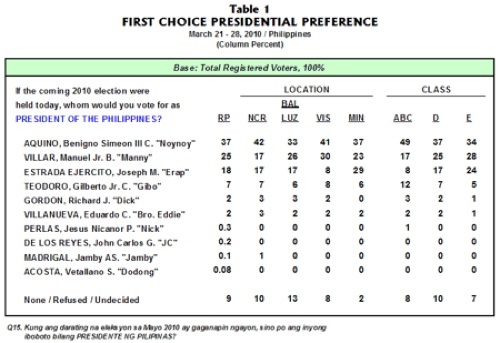 Eddie Villanueva with 3%.Nicanor Perlas, John Carlos “JC” de los Reyes, and Jamby Madrigal were chosen by less than 1% of respondents.Aquino was statistically the same as in the February 10 survey while Villar dropped by 4 percentage points. In the vice-presidential race, Sen. Manuel “Mar” Roxas II kept a comfortable 20 percentage-point lead over closest rival, Sen. Loren Legarda. He had 43% support while Legarda got 23%. Election officials had bought nearly two million ballot secrecy folders for the May 10 elections at an overpriced rate of P380 each, Senate Minority Leader Aquilino Pimentel Jr. alleged on Sunday. Citing information from a confidential source, Pimentel claimed there had been no bidding for the folders, which will be used to cover the ballot during voting. He declined to name the company that had bagged the contract from the Commission on Elections (Comelec). “I want Chairman [Jose] Melo to investigate this matter because this will taint the integrity of the Comelec. It looks like more than P300 per piece is too much… I cannot name my source because doing so will endanger his life,” Pimentel told GMANews.TV in Filipino. Senatorial aspirant Jose de Venecia III on Sunday called on the House of Representatives and the Senate to look into the reported use of wrong ink for ultraviolet security markings printed on ballots for the May 10 polls. De Venecia said the joint Congressional Oversight Committee on Poll Automation should determine whether the Commission on Elections (Comelec) and Smartmatic-Total Information Management Inc, the consortium that will automate the May 10 polls, conspired so that ballots would not be verified as genuine or not. “We urge the [committee] to immediately take cognizance of this seeming connivance of the Comelec and [Smartmatic-TIM] to remove a vital security safeguard for the [ballots] intended for our all-important electoral exercise,” he said in a statement. AND: Comelec, security officials decide Makati’s fate today. The Automated Election System (AES) Watch, Center for People Empowerment in Governance (Cenpeg) and Consortium on Electoral Reforms (CER) said a limited manual audit done after proclamation would further cast doubt on the results of the automated polls. LA TRINIDAD, Benguet , Philippines – The country would experience the most peaceful elections in history, the Philippine National Police (PNP) said. PNP chief Director General Jesus Verzosa cited records indicating a marked decrease in election-related violent incidents compared to figures during the 2004 and 2007 elections. He said that if the trend would continue, then the country is heading toward more peaceful elections on May 10. (Updated 7:10 PM) Seven of Metro Manila’s 17 cities were identified as possible election hot spots because of tough competition among local candidates, the National Capital Region Police Office (NCRPO) Chief said. Muntinlupa, Parañaque, Taguig, Makati, Pasay, Manila, and Quezon cities “are hotly contested areas,” NCRPO head Director Roberto Rosales said. “So far these are the areas where competitions are tight,” Rosales added in Filipino when he was interviewed by reporters at the National Police headquarters in Camp Crame. MANILA, Philippines – The Philippine Army has stepped up its campaign to protect and safeguard the credibility of the coming May 10, 2010 polls by using the most popular mode of communication: the mobile phone. The army recently launched a project called the “Info-Text for Credible Elections” that allows them to receive and respond to voters&apos; poll-related concerns. Citizens can send a text or SMS (short messaging system) to a special number, 0917-500-ARMY (2796).